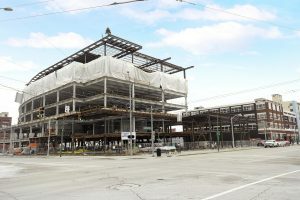 Downtown Dayton’s largest single-site employer, CareSource, is expanding downtown by constructing a new building at the site of the former Patterson Co-Op school. The building, which will be known as “CareSource Center City,” will complement the health care company’s current headquarters at Monument and Main streets as well as its Ballpark Village offices at Monument Avenue and Patterson Boulevard. CareSource Center City broke ground in 2017, and construction is well underway for the new, six-story, 206,000-square-foot office tower, located on the 100 block of E. First St. The new building will house 800 employees and is slated to open in 2019.